Today’s chocoholics are more demanding than ever before. There was a time, perhaps half a century ago, when “chocolate” meant “chocolate.” As our parents and/or grandparents skipped home from school, they contented themselves with plain Hershey or Snickers Bars. 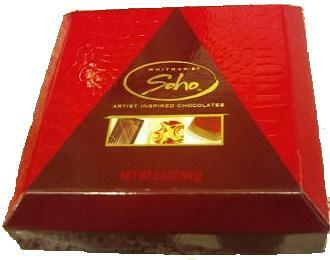 They didn’t give any thought to the quality of their chocolate, its regional origin, or its physical attractiveness. They didn’t care about cacao percentages or exotic flavorings. Unless they happened to be in the culinary field, neither did their parents. In that simpler era, all that most people considered was whether or not their chocolate tasted sweet, good, and at least slightly chocolaty. It doesn’t take a cocoa connoisseur to see those days are far behind us. With dark chocolate now labeled a “health food,” it seems like new purveyors of handcrafted artisan chocolate materialize every day. In an effort to keep up with trends, retain old customers and attract new ones, old-standby chocolate makers such as Hershey have released lines of upmarket chocolates, often quite successfully. On a recent trip to CVS, I noticed that old standby chocolatiers Whitman’s/Russell Stover, best known for their holiday chocolate collections, have gotten in on the act. While perusing the already center stage Valentine’s Day candies, I picked up Whitman’s “Soho” collection. I’d seen a similar collection the year before. I’d passed it by, less than eager to spend $5.00 on a 6-piece selection of drugstore chocolates, but my curiosity won out this time. Every year on my birthday, my parents would take me out for a special dinner. I used to love getting all dressed up and heading out to what I considered to be a fancy restaurant; the kind of restaurant that required reservations, served Shirley Temples in sparkling crystal glasses, and had beautiful chandeliers hanging from the ceilings. My mother would lay out a freshly ironed dress and a pair of patent-leather shoes for me, and I’d quickly get myself ready for my big birthday night. But it wasn’t the fancy lights or the Shirley Temples or the general fanciness of the restaurant that got me excited – those things were just added bonuses, background prettiness for the real star of the evening: the fancy awesome birthday dinner dessert. Every year, my parents would “surprise me” by ordering a piece of birthday cake and having the waiters come over and embarrass me to death with a variation of the birthday song. And every year, I’d hand the cake over to my dad and order a big old glass of chocolate mousse. There’s nothing better than good chocolate mousse. When you go to a restaurant that does it up right, eating chocolate mousse is akin to eating a giant vat of melted 3 Musketeers, with a dollop of whipped cream on top. It is brilliant and lovely and wonderful and all of the things that chocolate should be. Bad chocolate mousse is another story, as it tastes like stale chocolate milk crossed with an egg-crate mattress. It’s bad news, bears.